We are excited to begin our monthlong celebration of Graphic Novels. Every Thursday in October, we'll be celebrating Graphic Novels here on our blog. 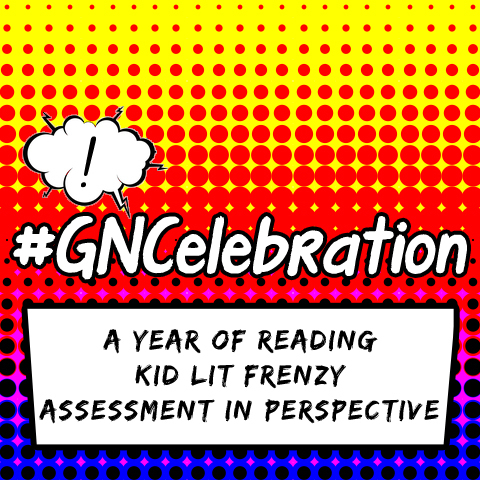 We are teaming up with blogger friends at Kid Lit Frenzy and Assessment in Perspective, so you'll want to check out their blogs every week too! If you want to know more about our monthlong celebration, read our Nerdy Book Club post announcing it. We also hope you'll join our Google Community where the party will come together! We love Graphic Novels and we want to share that love with the world. It was not easy for me to fall in love with graphic novels, but once I read Babymouse and fell in love with that character, I gave others a try. (Thank you Jenni and Matthew Holm!). I still find them a bit tricky as I have to constantly remind myself to spend time with the visuals--I tend to want to read quickly through the words and move on. But knowing Graphic Novels and having many in my classroom has changed our Reading Workshop. I have several baskets of favorite authors and series in the Graphic Novel section. I have graphic novels in a variety of genres and I have graphic novels that span a variety of levels. So there are graphic novels for everyone. I find that these are fabulous additions to our classroom and I am so glad I listened to Mary Lee and let her show me how to read these. In preparation for today's post, I dug into the Graphic Novel tag on our blog and was amazed to see how many graphic novels we've shared on the blog over the years. To kick of our Graphic Novel Celebration, let's celebrate Raina Telgemeier! I discovered Raina's work in 2010 when I read Smile. I fell instantly in love with it and couldn't wait to read more by this author. The idea of a Graphic Novel memoir was something I hadn't considered and I found the story to be fascinating. This was one of the first graphic novels I read that helped me understand that graphic novels were not a "genre". Instead they could be any genre and Raina wrote a genre I had never read in a graphic novel. It totally drew me in! Since then I've read all of her books and have loved every one. She is already a favorite in our classroom as my children can identify her art and notice when they see a new piece in a graphic novel anthology (such as Comic Squad Recess!). My student relate to her stories and talk about "Raina" like she is sitting with us sometimes. Her writing and art combine to create some of the most amazing stories I've read. She really changed my whole understanding of what a graphic novel could be and the impact it can have on readers. Raina is a rock star in the graphic novel world. She was one of the authors who changed the way we thought about graphic novels and she continues to create amazing works. If you did not get a chance to hear her interview on The Yarn about Graphic Novels, it is so worth listening to. It is an amazing interview by Colby Sharp and Travis Jonker. Lately, Raina has been updating the Baby-Sitters Club books by Ann M. Martin. I love that these books that so many of us loved years ago, are back in graphic novel form. This gives students two ways to fall in love with the characters. A few years ago, Raina did black and white versions of a few of the Baby-Sitters' Club books but now they are being published in FULL COLOR. And they are fabulous. It is amazing to see my kids pick these up BECAUSE they know and love Raina's work. I love that they can see the power of her work in so many different stories. I can't imagine what it takes to create one of these full color Baby-Sitter Club graphic novels. Needless to say, they are not being released as fast as we would all like as I am sure they take a while to create! But this week, the full color edition of book #3 was released: Mary Anne Saves the Day. And we are giving away a copy as part of today's celebration! Complete the Rafflecopter below for a chance to win. Comment on this post for an optional entry! 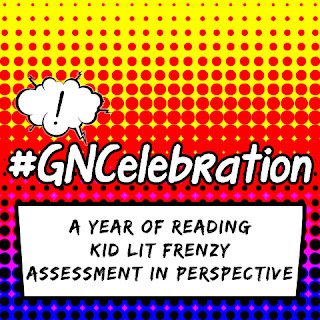 Celebrate graphic novels with us today by reading or sharing one of Raina's books with students or colleagues! Go Raina! Although I regularly recommend and use graphic novels with kids, I am not a graphic novel lover. Like you, I tend to run through them way too fast. I need Mary Lee to come and teach ME how to read them! Maybe a post on that this month???? Looking forward to reading your series! I love her books, particularly her skill in creating characters that we believe in. The graphic element is important, of course, but she mixes it perfectly with storytelling, too. I wrote this morning about using Calvin and Hobbes in the classroom, and then realized it fit perfectly with the start of this inquiry around graphic stories. I struggled to become a graphic novel reader too, but now it's possibly my favorite format. I think I also STILL tend to read them too fast, but the best ones reward rereading and since they're quick reads even if you're reading slowly, I don't mind putting in the time to reread. Love Carol's idea for a post on how to read graphic novels! Might have to steal that for my own blog! I love the new covers, and I love how these stories have been re-done as graphic novels. It's a great way to get readers into the Babysitters Club series! I'm with Elisabeth and tend to read these books way too fast! I love Raina's work! So many students can connect to her stories. Smile is a big hit and it has led students to look for other graphic novels that are memoirs, like El Deafo by Cece Bell, which is also a hit! We found ourselves having to remember to slow down when we read graphic novels too. I guess we are all getting used to integrating visual information and print. This is one genre that students are much more accustomed to reading. Love them. El Deafo newest favorite. Love, love, love the interview with Raina on The Yarn! I think her book, Smile, is what won me over as well. My newest favorite GN is Roller Girl and it was perfectly timed last spring for a fourth grader who was interested in learning roller derby herself.